The Book of Jeremiah in the Old Testament is spine-tingling. I’ve heard too many people say it’s the longest book in the Bible, and that may be so, but that fact is given as a reason why it’s not read. Jeremiah was just a normal, whiney, complaining, weeping but faithful man that God breathed life and power into. He became a one-man battalion of Heavenly truth and covenantal faithfulness in a culture of lies, more lies and damned lies. Jeremiah stuck to his task because he stuck to God. He was God’s Law enforcer and God’s heart revealer. 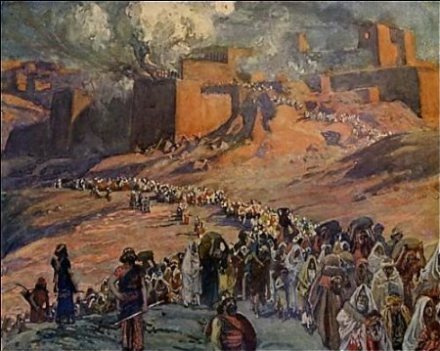 The events that led to the Babylonian Exile of 586 BC had Jeremiah at the centre of them. Events that determined the shape of the covenant people of God for over a thousand years, maybe even beyond that, to something like…..forever. But the sixth century BC was not just a cataclysmic time for the people of Judah, it was, it seems in God’s providence, a most astonishing time all over the world, in philosophy, religion, politics, art. As well as in Judah with Jeremiah, in China, India and Greece, the foundations were being laid for humanity that still affects billions of people today. Karl Jaspers calls this century, Jeremiah’s century, the “axial time”. Eugene Peterson calls Jeremiah a “mountain to be mined on all flanks.” Jeremiah is God’s man at the right time in the right place, being faithful, and speaking God’s Word to God’s wayward people in a time of unprecedented global upheaval (not that Jeremiah knew that)! So what was going on globally? “His contemporaries had no way of knowing it, but Jeremiah was the brightest star in what scholars centuries later would see as a constellation of religious leaders strategically placed across the world. The seventh and sixth centuries BC were renaissance centuries in matters of the soul and God. In other parts of the world Zarathustra was beginning a new religion in Persia; Lao-tse was forming Taoism in China; the Buddha was beginning his great reform movement in India. In Greece, the philosophers Thales and Anaxmander were laying the foundations of Greek philosophy. All over the world there was yearning and hunger and thirst for righteousness. Deep thinking and ardent yearning seem to characterise what we know of the centres of civilisation in China, India, Persia and Greece.